Many species of spiders make their homes in the gardens of Rhode Island. Although the types of spiders typically found in the state's gardens are extremely dangerous to their insect prey, most of the area's spider species pose no threat to the humans who work in or visit those gardens. Wolf spiders, like all spiders, are predators, and their method of obtaining prey involves actively moving about gardens in search of insects. They are usually nocturnal hunters, and they hide in burrows during the day. The Carolina wolf spider, which can reach a body length of more than 1 inch, is the largest wolf spider in the country. It is dark-colored, either brown, gray or black, and moderately hairy. It makes its underground burrows in secluded parts of a garden and, despite its intimidating size, is more likely to flee when disturbed than to bite. Web-weaving spiders build webs to snare their prey, and they lie in wait in or near the webs rather than roaming through gardens. Some garden spiders, which are members of the group of web-weaving spiders commonly called orb weavers, build sticky, circular webs up to 2 feet in diameter. The webs are usually suspended between plants or structures, and the spiders, which have weak eyesight, wait in the webs until they sense the vibrations caused by insects trapped in the webs. The banded garden spider is a web-weaving species common in Rhode Island. It has a body length of about 1 inch and black, white and yellow stripes running horizontally -- from side to side -- across its body. Sac spiders are nocturnal hunters, and during the day they hide in silk sacs that they build in leaves, woodpiles and other secluded areas, including gardens. Although they live primarily outdoors during the warm parts of the year, they may move into houses when the weather turns cold. The yellow sac spider is light colored and small, with a body length of less than 1/2 inch. Its front legs, with which it feels for prey while hunting, are longer than its six other legs. Funnel web spiders are typically large, with a body length up to 3/4 inch, and dark-colored. Their hunting behavior has characteristics in common with that of both hunting spiders and web-building spiders. 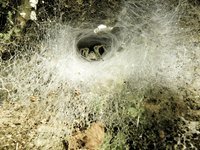 A funnel web spider builds a dense, sheetlike web with a funnel-shaped tube in which the spider hides. When an insect touches the web and the spider senses the resulting vibration, it leaps from the tube and attacks the insect. The grass spider is a funnel web spider common throughout New England. It is gray or brown with a body length between 1/3 and 2/3 inch. It has darker brown stripes on its back and distinctive tail-like appendages at the rear of its abdomen. As its name implies, the grass spider typically builds its webs in grass; but it also makes webs in other plant foliage. Kaufman Field Guide to Nature of New England; Kenn Kaufman et al.